The Mint Act of April 2, 1792, established the half cent as the smallest denomination of United States coinage. The United States Mint first produced half cents in July 1793 with a short mintage of Liberty Cap half cents. Unfortunately, half cents were not well received by the public and did not circulate. After 1811, production was intermittent and specimens were rarely seen in circulation. The mint produced the last half cents in 1857 due to lack of demand and the rising price of copper. The Classic Head half cent was designed by John Reich. Originally misnamed "Turban Head," it was rumored that Lady Liberty was actually portrayed by Dolley Madison. This gave birth to the name "Classic Head." Over the years, there have been several restrikes that occurred outside the mint using discarded dies. These restrikes are usually identifiable by raised lumps on the surface of the coin caused by rust on the die. Although there may be some small variance, each coin weighs approximately 5.44 grams, is composed of pure copper and has a diameter of 23.5 mm with a plain edge. 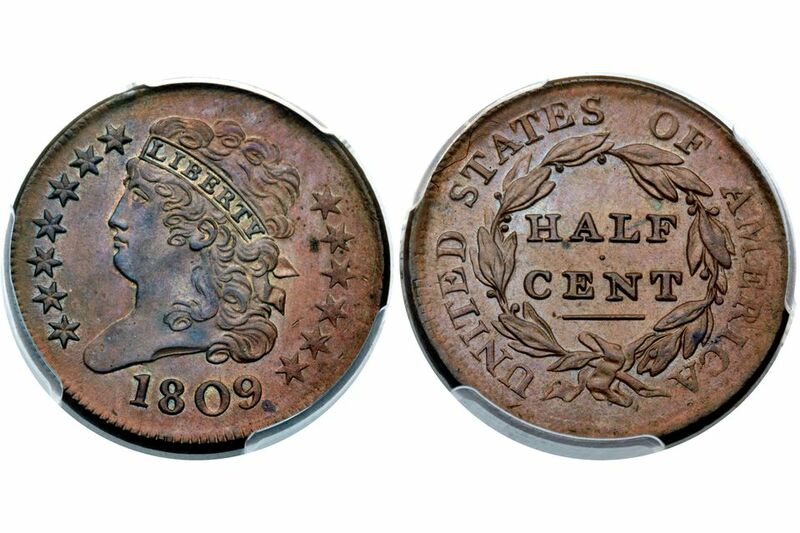 The Classic Head half cent was replaced by the Coronet Head half cent beginning in 1840. From 1837 until 1839, demand for half cents declined rapidly and no half cents were minted after 1857. Most circulated Classic Head half cents are reasonably priced for the beginner or intermediate collector. Attractive circulation strike specimens can be easily found it your favorite coin dealer or coin show with attractive grades ranging from Very Fine to about Uncirculated. Most uncirculated coins will be worth at least $200. Mint State coins available from coin dealers originated mostly from old coin hoards. These specimens are often spotted and you should exercise extreme care when buying raw coins to avoid purchasing a damaged coin. There are six years that the mint also produced Proof coins with the 1836 half cent being only minted in Proof. Specimens dated 1831 and 1836 are extreme rarities and only should be purchased in authentic third-party grading slabs. All Classic Head half cents were produced in Philadelphia and do not have a mint mark. The sell value is what you can expect a dealer to pay to you if you sell your Classic Head half cent. All circulated values assume that the date is readable and not completely worn off the face of the coin. Additionally, these prices and values assume the coin is not damaged (scratched, dented, scraped, etc.). These are approximate wholesale values. The actual offer you receive from a particular coin dealer will vary depending on the actual grade of the coin and a number of other factors that determine its worth. "-" = Columns with a dash indicate that not enough data is available to give an estimated value. This does not necessarily mean that the coin is rare or expensive. Proof = Values and prices for a Proof specimen.